3 Bedroom Semi Detached House For Sale in Hassocks for Guide Price £415,000. In a delightful semi-rural setting on the outskirts of Hassocks village is this charming semi-detached cottage with well presented interiors, set within attractive gardens. Being one of the original six Muddlestone Cottages, the property retains a number of period features including exposed original wood floors across the ground floor and exposed beams. The house is entered via an enclosed porch with a flowing layout leading to the principal reception rooms. Of note is the 15ft sitting room with its characterful fireplace and open fire; double aspect windows look over the front of the property and patio doors open to the garden at the rear. A separate dining room provides a formal entertaining space and leads to the country-style kitchen, which is fitted with a range of wall and floor units in stylish wood complemented by tiled splashbacks and a butler sink, with ample space for freestanding appliances. A stable door leads to the garage which also has access to the garden. A family bathroom with integrated bath tub and over bath shower completes the ground floor accommodation. On the first floor there are three charming bedrooms, including a 15ft master bedroom with double aspect windows, two fitted cupboards and characterful wood floors. A hatch to the loft space is situated on the landing. 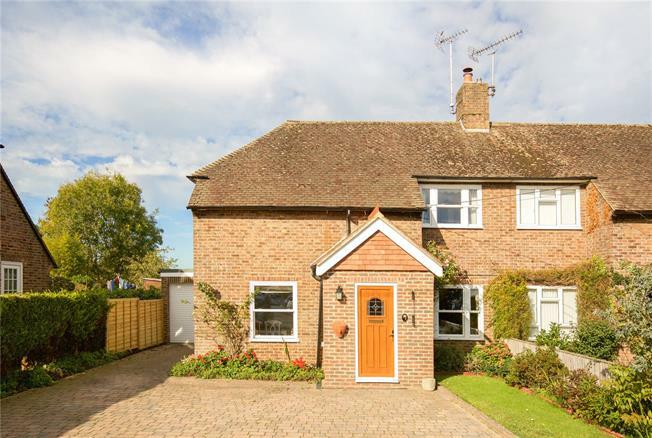 Located close to the South Downs National Park, the delightful village of Hassocks is surrounded by beautiful natural scenery and offers excellent transport links. Benefits to the village include a bustling High Street with restaurants, independent shops and convenience stores, a monthly farmers’ market offering local produce, and a mainline train station with fast and frequent services to London Bridge/Victoria (approx. 55 minutes) and the South Coast. The M23/A23 provides good access to Gatwick and the national motorway airport. The semi-rural location allows for stunning local walks over the Downs at Ditchling Beacon and the Devil’s Dyke and leisure pursuits such as golf at Hassocks Golf Club and Singing Hills, racing at Brighton and Plumpton, showjumping at Hickstead and sailing from Brighton Marina. To the front of the property there is a good-size brick-paved drive with parking for several cars, with a single attached garage with electrically operated door to the side of the property. The drive is enclosed by hedges and wooden panel fencing, an area of lawn and flowerbeds providing seasonal and year-round interest. Access to the rear of the property is via the garage, where there is a paved patio adjacent to the house partially shaded by a gazebo with climbing wisteria. The patio looks out over a lovely mainly level lawn enclosed by hedges and shrubs, a wooden shed and apple tree.